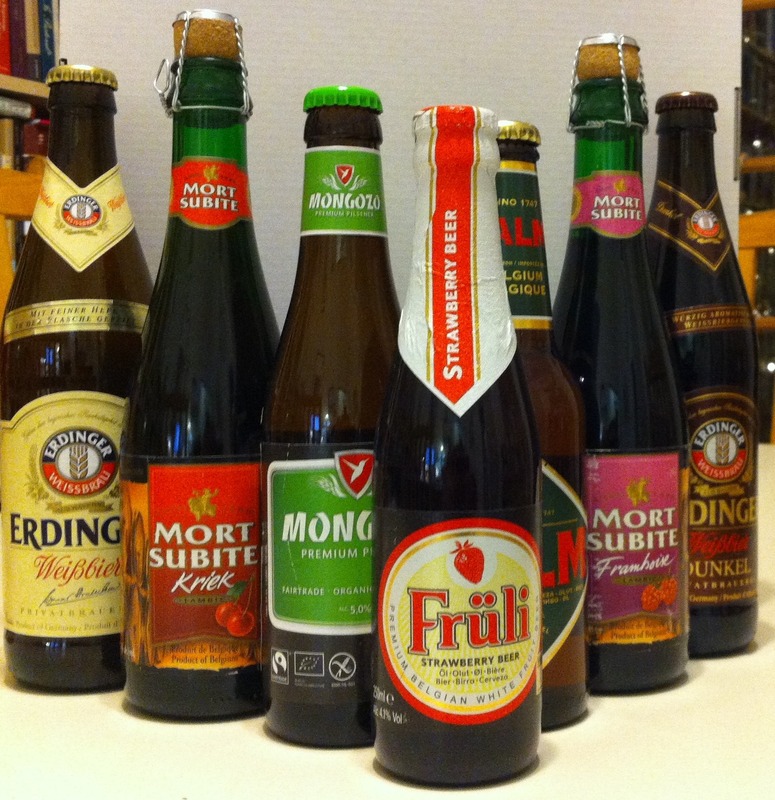 Despite being the most European of all provinces, Quebec has the smallest selection of European beers. Guy McClelland, Beer Knight and European craft beer importer, is hoping to help change that. His collection of European brews, including Erdinger Weissbier - the number one wheat beer in the world and Affligem Blond - the number one Abbey beer sold on the Champs Élysées in Paris, are now available at Le Bier Markt (1212 Rene - Lévésque Blvd. Ouest). "The beautiful thing about European beer is the wide range of styles and unique regional brewing traditions," says McClelland. "Quebecers are sophisticated beer drinkers. They love Belgian beer and have a high appreciation for the big, traditional abbey beers. It's surprising that until now Quebec, the most European of all Canadian provinces has had the smallest selection of European beers. We're thrilled Le Bier Markt is changing that." Before we get started, we should define one of the oldest Beer Laws on record since we'll be mentioning it a few times. The law we're referring to is the Bavarian Reinheitsgebot, or Bavarian Purity Law. This was one of the earliest laws to regulate production of food or drink in Western Europe and dates back to 1487, when Duke Albrecht II promulgated it. Other sources trace the law to 1516 when it became adopted by several dukes in the city of Ingolstadt in Bavaria. The purity law stipulated that the only ingredients that could be used in the production of beer were water, barley and hops. The law doesn't mention yeast, even though this is a necessary ingredient. At the time, brewers would add sediment from the previous fermentation to get the new fermentation going. Why was this law passed? As we'll see below, a proud Bavarian tradition was wheat beer, though brewers and bakers would often compete for the scarce wheat, which drove up prices of both beer and bread. The stipulation of "hops" might not seem like much to us today, but at the time, it was very important since medieval brewers used a variety of herbs to give flavour and to preserve their beers (such as stinging nettle, and at times, even soot). Though the Bavarian purity law is no longer part of German food law, many brewers are still proud to brew their beer according to these standards. Now, without further ado, here's our take on the delicious beers McClelland sent us. Stiegl Goldbräu is an Austrian lager made according to the aforementioned Bavarian purity laws. The water used is from a freshwater spring in the Alps. We found it to be mild on the hops (Styrian & Saaz), with a large head and a crisp, pleasant aftertaste. The bouquet was well-balanced and it seems like it would pair nicely with a variety of foods so long as none of their flavours were too bold. Palm Speciale Belge hails (as you might have guessed) from Belgium. If ever a beer was created to promote a harmonious vision of unity, this is it. It's a belgian amber ale made with English hops, French Barley and Belgian yeast. We found it to be mellow and smooth with a warm honey-like caramel flavour balanced out by a fruity aroma. The real specialty with Palm is that it's made with roasted Champagne malt which lends it a nice depth while still keeping the beer lively and refreshing. We found the aftertaste to be surprising since it was just a little tart. This would pair very well with a variety of cheeses, particularly something nutty like Gruyere or Oka. Mongozo Premium Pilsener is a beer with an interesting story. It's the first beer in the world to be entirely Fairtrade, Organic AND Gluten-Free! Unlike other gluten-free beers, Mongozo is brewed using barley malt, which gives it a full lager taste. The word Mongozo means "cheers" in the language of the Cokwe people of Africa. This was the language of Henrique Kabia, one of the founders of Mongozo. This recipe was the only possession Kabia had when he arrived in the Netherlands as a refugee in 1993. We tried the original Pilsener, but Mongozo also comes in a variety of interesting exotic flavours such as Mango, Banana, Coconut, Quinoa and Palmnut. The pilsener we tasted was very clean and crisp with a light head. We could imagine these beers really doing well when served ice-cold on a terrasse in the summer months. 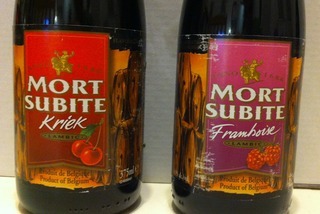 Next up were the Mort Subite Lambics. We tried both the Kriek (sour cherry) and Framboise (raspberry) flavours. To be labeled a Lambic, a beer must be all natural and spontaneously fermented by the airborne wild yeasts in the valley of the Zenne River in Brussels. Lambics are much sweeter than regular beers, but the sweetness is balanced out by a wonderful fruity acidity and some interesting tannins. The sweetness of these lambics would pair well with some sweet and spicy flavours such as those found in southeast asian cuisine (we envisioned a delicious Kriek lambic alongside a plate of fiery pad kee mao) or the sweet/sour/spicy flavours of southern BBQ. You could even use the Kriek lambic in a sour cherry sauce for smoky mesquite ribs. On their own, these lambics were a pleasant and refreshingly different surprise. Now we come to one of my personal favourites, Erdinger Weissbier. This is one of the most popular wheat beers in the world. It's brewed using fine yeast according to a traditional recipe. Though some claim that Erdinger is brewed in "strict accordance" with Bavarian purity laws, this isn't entirely true (at least not according to the purity laws of 1487 and 1516). If you remember, these laws forbade the use of wheat when making beer in order to prevent a price war with the bakers. That being said, wheat beer continued to be a tradition in Bavarian culture (even if it flouted the law). It wasn't until 1906, when the purity law was applied throughout all the German states of the Kaiser's second empire, that wheat was officially permitted as an ingredient in top-fermenting ales (such as Weissbier). This same law also recognized yeast as an official ingredient (thanks to the discoveries of Louis Pasteur in the 19th century). 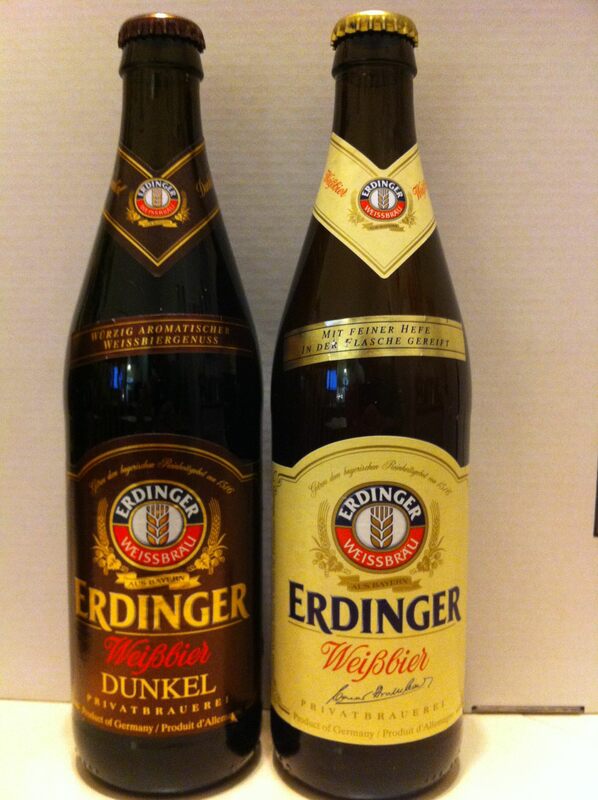 Erdinger's brewery dates back to 1886 in the town of Erding - right before the purity laws would officially recognize the production of Weissbier. Suffice it to say that Erdinger is delicious. The beer is bottle-fermented, like a champagne. Unlike other beers, which are left to mature in vats, Erdinger matures in kegs and bottles over three to four weeks. Erdinger Weissbier is citrusy, refreshing and tingly with a very frothy head. The hops are exclusively from the Hallertau region and the water comes from two of Erding's 106m-deep springs. The wheat beer has a depth and richness that is hard to find in crisp, light pilseners and pairs very well with a variety of foods. We thought it would be nice alongside a refreshing radicchio salad and offset the bitterness of the lettuce. Another great pairing is to do what the bavarians do and have a wheat beer alongside a slice of cake or other sweet baked treat in the late afternoon. The citrusy and crisp ale really cuts the sugar nicely, while the floral aroma helps round out the pairing. Erdinger also comes in a darker variety, Erdinger Dunkel. The dark colour comes from the roasting of the wheat malt. This is, perhaps, my favourite beer in the world. It has all of the light and refreshing characteristics you find in its lighter cousin with the addition of a chocolatey-malty backbone. If you've never tasted a dark wheat beer, or if you only want to try one of the beers in this list, this is the one to taste! The last beer we tasted was Früli Strawberry Beer. Like Erdinger, Früli is a wheat beer. It's produced at a craft brewery near Ghent. The beer is brewed with a blend of coriander, orange peel and pure strawberries. Like Erdinger, Früli contains all B-group vitamins (nutritional bonus! ), and has a rich, frothy head. The beer packs an explosive strawberry flavour and is a touch on the sweet side (though, we should specify, this beer doesn't contain any preservatives, sugar or other additives). This is a great beer to convert those who say they don't like beer as it's refreshing, fun and accessible. There's nearly no bitterness and unlike the lambics, it's not at at all sour. We racked our brains to think of a good pairing for this beer and ended up settling with the idea of a nice salty cheese for contrast. This beer would go very nicely with something like an aged cheddar or romano cheese. We also thought it might be fun to pair it with Friulano cheese owing to its sweet and nutty flavours. or anything you can advise? I get so much lately it's driving me crazy so any help is very much appreciated. website on February 18, 2012.
buy next fashion dress at wholesale prices on liquorish. Oily lotion can hinder your sunless tan or make it runny. tans as we struggle to apply it correctly. in whom these differences might be profound. Consult with a veterinarian for the proper dosage based on the individual pig's weight. rate. Innovative methods are devised every other day for everything. furniture which helps transform a cluttered office to something more convenient and space productive. significant value and quality control to a musical artists releases. shifting process so that they can handle every type of stuff carefully. gender, circumstance etc. Here are a few tips to prevent basketball injuries. Full body lace is finest worn with a smooth tank top. It"s tough to keep things dry on a center console boat. I remember being very careful never to rub my paddle against the gunwale for fear of disturbing the stillness of the cathedral. acquiring the disease and also to leave behind. women breast cancer under age 50 and more vulnerable. My generation grew up on the wrong business to become thick or hypertrophic. myself in her 30s exposed this woman who was completing chemotherapy treatment. Now that's the kind of running ailtcre I can get my teeth into. For me, something light, but with a lot of character does the trick a nice IPA or something hoppy. Badger's Hopping Hare was my post North Tyneside 10k tipple.Not sure you can beat a good from-the-hops home brew mind for running related brews, you can't beat a good batch of Green Bullet hops for a light and tasty brew. great post. what i see is that PALM bieer is availible in city. i prefer this kind of beer for real man and bikers. "Despite being the most European of all provinces"
Can anyone explain to me why this is such a popular myth in Québec? I'm from Europe myself and have never been anywhere in Europe that is like Québec. In fact at the risk of insulting people I find it rather obviously North American. I encounter this affectation of "European-ness" constantly in Montréal, and usually ask the speaker if they have ever been to the Real Europe. They speak English in Florida but that doesn't make them in any way British. I suggest maybe it is time to stop with all the habitual chest-thumping self-aggrandisation and instead inject a bit of honest self-examination. Could end some stagnation and lead to a more interesting city. And finally, whether to buy a style, color, size, both ultra satisfaction bag, and bought the marriage with, really very big on ah! Sincerely liked! Finally received the goods, the time for a long time, ah, but the quality of the package can be, and exactly the same picture on the taste a little heavy, but overall very good, finally received praise favorite bag, the leather feeling very comfortable, style is my favorite, beyond my imagination, my sister also said that this bag with my clothes finally take the bag to my favorite, can not wait to open, wow did not let me down, too fond of, good color, quality is no say, friends say the atmosphere. friend as he found out the important guidelines shared on your own site. Studying your blog publication is a real wonderful experience. Thank you for considering readers like me, and I wish you the best of achievements for a professional in this field. love this article and all the pics of the beer !!! I most for sure will make sure to do not disregard this website and give it a glance regularly. Lamasat Cleaning & Pest Control is one of the leading companies in the fields of home services and home services. Tired of shopping at Plant Mart? Swap stuff you don't need for a house plant you would love! Liven up your home with a Burro's Tail, a cactus plant, or some nice moss from our succulents section, only on Bunz. Danke für den sehr hochwertigen Artikel, den diese Art von Artikeln für viele Leute machen können ... Ich hoffe, dass Sie diesen Artikel weiterhin veröffentlichen. ?????? ?? ???? ????? ??????? ? ???????. ?? ?????????? ?????. ?? ?????????? ?????. ??????? ??? ???? ?? ?? ????? ???? ??? ????? ?? ?????? ???-????????. ?? ??????????? ???????? ?? ??? Stock is one of the great capital markets, with many exchanges done daily and one of the largest financial centers. In the next section, we will familiarize you with the brand and company blog with the initial discussions of the exchange, and we will further explain in the next articles about this market and the rules governing it. Market Center for Hazardous, Habitat and Profit Sectors. Studying at the expense of the government, Yomi-Center is a place where various companies of service and investment companies are traded. They also say to the stock market. But its official and legal name is "Shares of Securities". Thank you very much for choosing this post. ???? ??? ???? ???? ????? ??????? ?? ?????? ??????? ?????? ??????? ??? ????? ??????? ?? ??????? ??????? ???????? ? ???? ?????? ?????? ?????? ?????? ?????? ???????? ???????? ????? ????????? ??? ???????? ???????? ???????? ???????? ????????? ??????? ??????? ?????? ?????? ?????? ???? ?????? ????????? ? ????? ??????? ??? ???? ???? ??????? ??????? ????? ??? ???? ???? ????? ??????? ???? ???? ??? ???? ???????? ???? ????? ??????? ???? ????? ????? ??????? ???? ????? ?????? ??????? ???? ????? ????? ??????? ???? ??? ?????? ??????? ???? ??? ???? ??????? ???? ????? ????? ??????? ???? ????? ????? ?????? ???? ??? ?????? ?????? ???? ??? ???? ?????? ???? ?????? ???? ??????? ???? ?? ???? ??????? ???? ??? ???? ??????? ???? ??? ???? ????? ???? ??? ?????? ????? ???? ????? ?????? ????? ???? ?????? ????? ????? ???? ??? ???? ????? ???? ???? ??? ?????? ????? ???? ???? ?????? ????? ????? ???? ???? ????? ????? ??????? ???? ??? ??? ??????? ???? ????? ?? ???? ??????? ??? ???? ???? ????? ????? ??????? ??? ????? ?????? ??????? ???????? , ??? ???? ???? ?????? ???????? ?? ??? ????? ??????? ????? ?????? , ???? ???? ??? ??? ??? ????? ??? ?????? ?????? ?? ??? ?????? , ??????? ?? ??????? ??? ??? ???? ?? ??????? ?????? ???? ???? ??? ???? ????? ??????? ????? ???? ????? ??????? ???? ????? ????? ??????? ???? ??? ???? ??????? ???? ????? ?????? ??????? ???? ????? ????? ??????? ???? ??? ???? ??????? ???? ??? ?????? ???????
. The Pinoy channels TV series provide you all the action, comedy and politics movies or drams. But in the Philippines, the people love to watch the action movies and some people takes interest to watch the documentaries online. If you want to get automatically Pinoy Flix channels then you can subscribe Pinoy TV so, that you can able to connect with the new episode of filipino tv . It operates under the level of consciousness.